The popular Powerlink Switch w/Airplay has now got new functions. - An additional build-in input filter to reduce a potential humming risk to minimum. - NO MORE 60 seconds delay between analog sources. New Switch allows you to decide and control time yourself! - Manual volume level control function. With extra TOSLINK input and digital procesor inside! The device is 100% compatible with B&O devices and provides you the solution to many problems of audio installations, such as feed-in of any audio sources to B&O systems, connection of B&O speakers to the audio devices of other manufacturers, etc. All audio signals - whether digital or analog - will be converted into 100% standard compliant B&O Powerlink signal including the circuit voltage required. 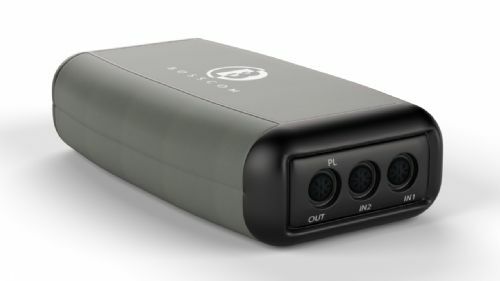 Any stereo audio sources can be connected to IN1 (DIN-8/RCA), IN2 (DIN-8) and SPDIF/TOSLINK IN which has a volume controlled output. 3 DIP switches on the bottom side of the Powerlink Switch for Airplay will allow you to choose the priorities between the audio sources connected to your Bang & Olufsen speakers. Connect your Apple Airport Express to TOSLINK IN via fiber optic cable and equip your B&O system with the Airplay function! Bang & Olufsen / B&O, Airplay are all trademarks belonging to Bang & Olufsen A/S and / or Apple Inc. BOSSCOM has no connection to Bang & Olufsen A/S & Apple Inc., and BOSSCOM recognises Bang & Olufsen A/S’ & Apple Inc.'s trademark rights.